Last February I went to Illinois to visit my children for a week. I've been covering the highlights of that visit the last couple of months on my Wednesday Travel Posts. We had a Breakfast Fit For A President at Buttermilk Restaurant in Geneva, we visited the Chicago Museum of Science and Industry, we enjoyed Tea For Two (or three?) at Cafe K'tizo in Wheaton, and we spent an entire day at an IKEA store giving us quite the IKEA Adventure. My last full day in Illinois was spent at the Chicago Field Museum. It was a Saturday, so my son was off of work and able to join us on this adventure. 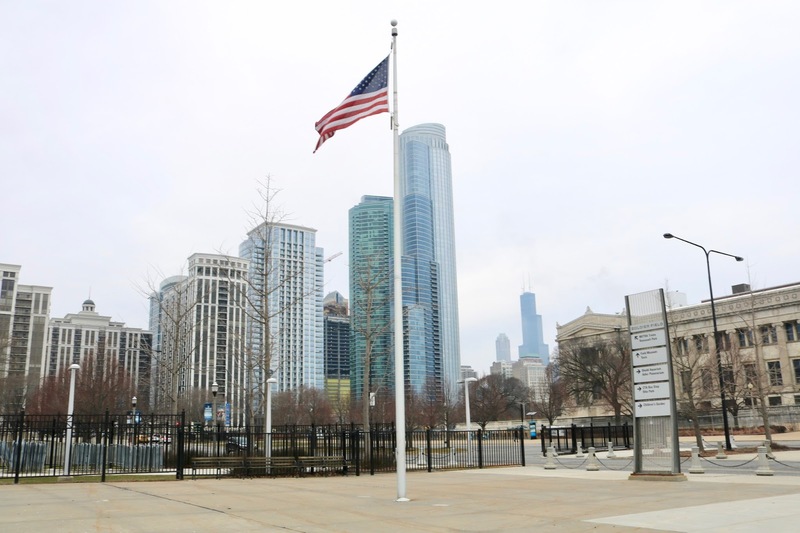 The Chicago Field Museum is located right in downtown Chicago along Lake Michigan; so there are both gorgeous views of Lake Michigan and the Chicago sky line. 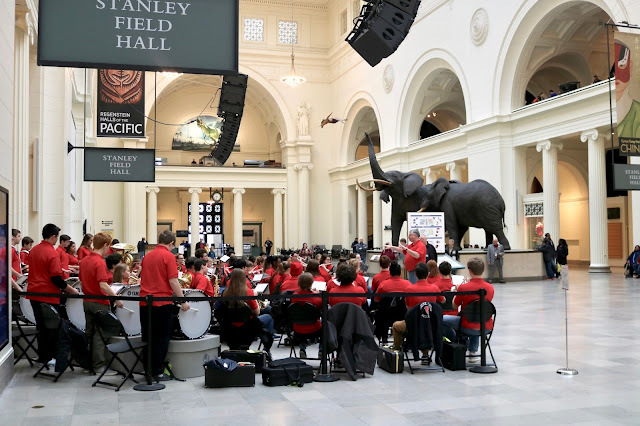 When we first walked into the museum there was a band playing in the lobby. That was a fun surprise! There are also two life size elephant statues in the lobby. Of course I had to take Jason and Jordan's picture next to them for scale. 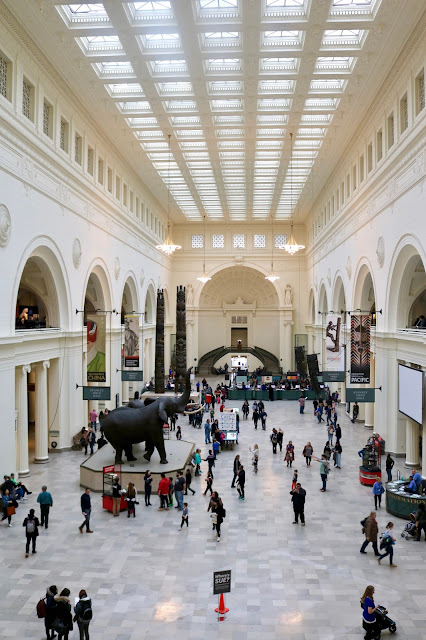 Like most of the museum buildings in Chicago, the Chicago Field Museum is located in a gorgeous, historic building. 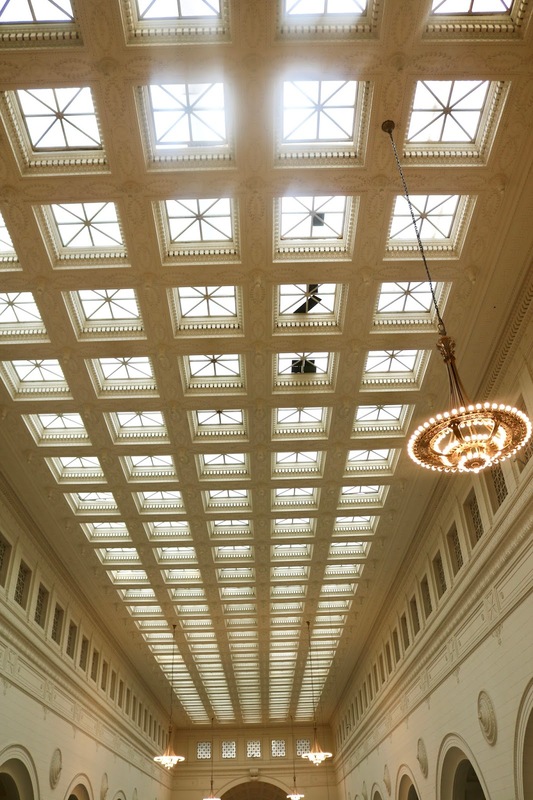 I just loved the ceiling and the arched window openings in the balcony level. Isn't this ceiling just stunning? Love all the natural light. This is a huge museum. It can be overwhelming trying to even see everything in one day. I don't even think it's possible. 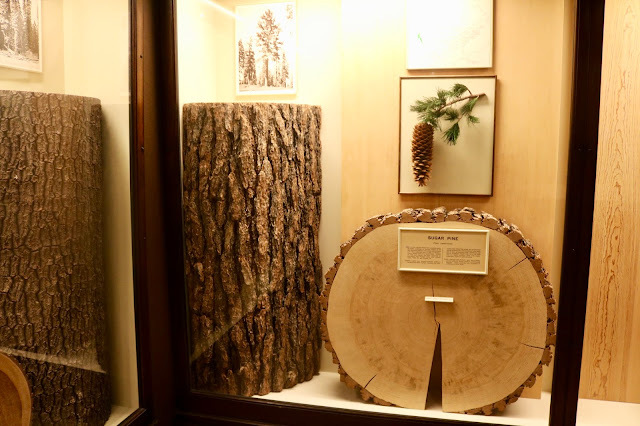 If you ever have the chance to visit this museum, look at the map first and pick the exhibits you think you might be the most interested in, because you may run out of time to see them all. 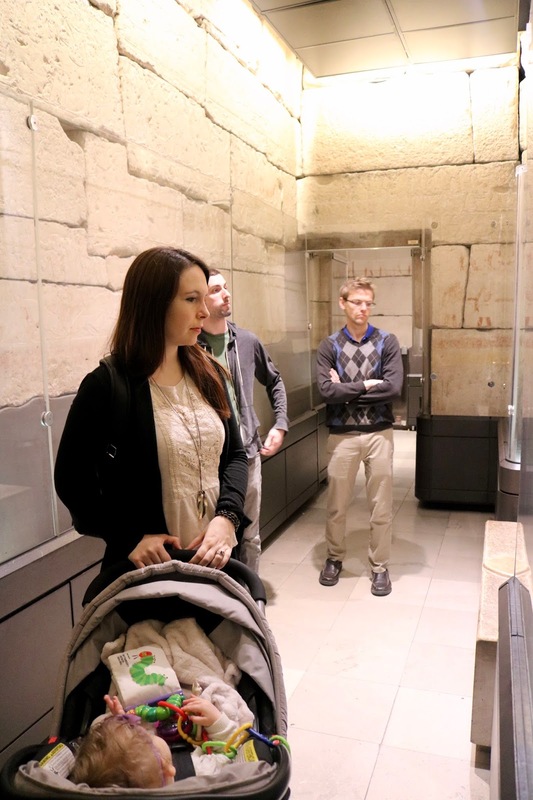 The first exhibit we visited was "Inside Ancient Egypt". Here we explored an ancient Egyptian tomb. It is a three-story recreation of a mastaba which features two authentic rooms from the 5,000-year-old tomb of pharaoh’s son Unis-Ankh. Here we are examine floor to ceiling hieroglyphics. 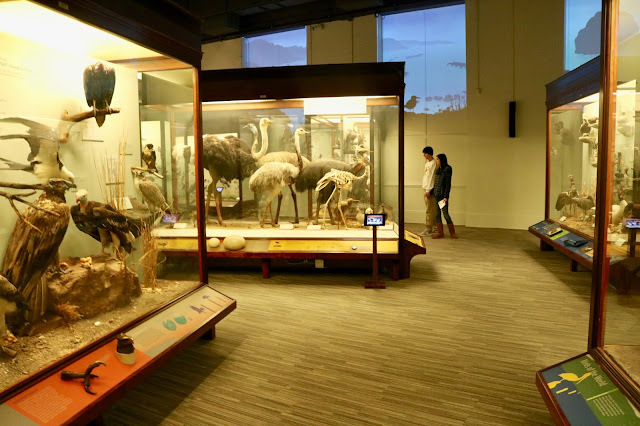 Next, we went to the Hall of Birds. 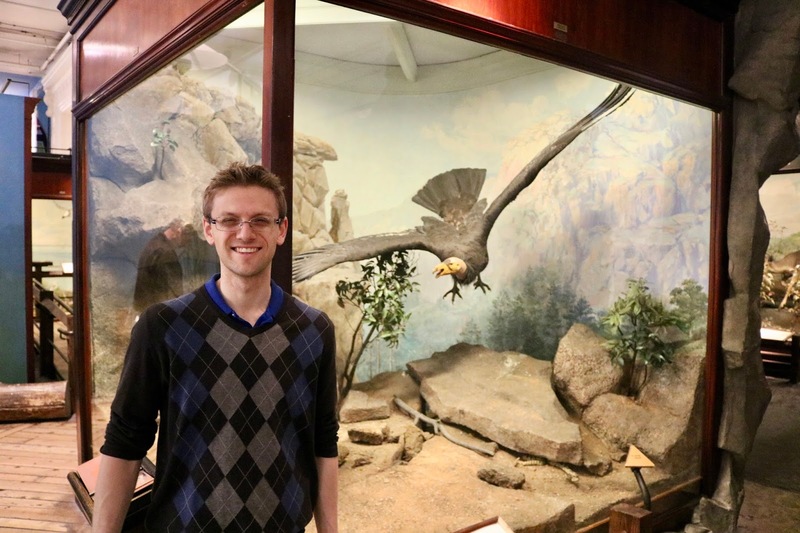 Being a huge bird lover, this was one of my favorite exhibits in the museum. We spent a lot of time here. I was blown away by the wingspan of this bird. I've never seen so many bird specimens in one place in my life. The hall seemed to go on forever. It was amazing seeing all the different species of birds. I loved being able to study the birds up close and learn all about their unique features and capabilities. 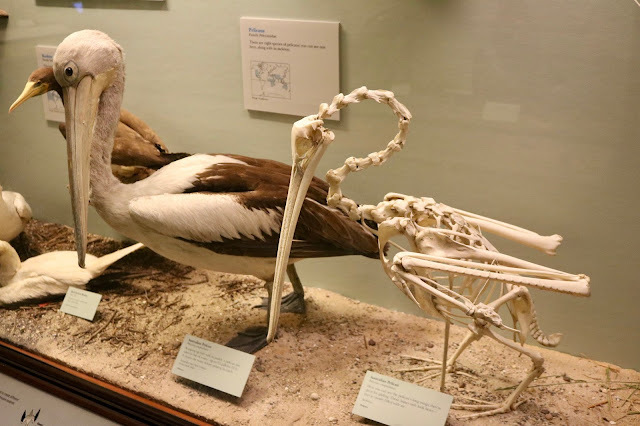 I also liked how many of the birds included a skeleton version as well. 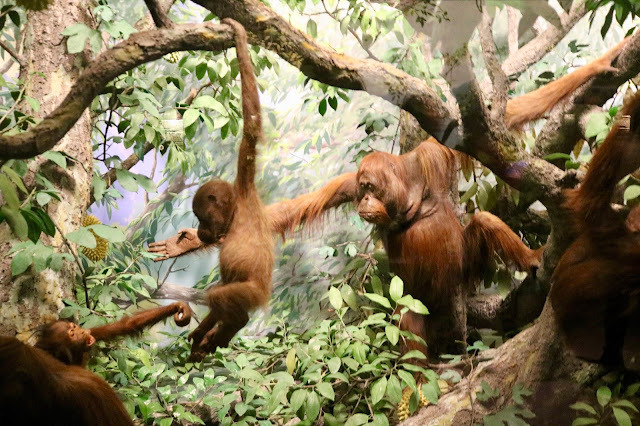 We continued on with the exhibits on the west side of the main level with Africa, the World of Animals, and the Mammals of Asia! I think this was one of our favorite areas of the museum because we got to see so many animals. My son, an animal lover, didn't like it. He said "It's a museum for dead animals". I told him he shouldn't look at that way. When will he ever be able to get so close to a wild animal to study their unique features and get a better idea of their size? I'm not entirely positive how these animals came to end up in the museum, but I would hopefully assume most of them died of natural causes. We saw several displays of cats (my favorite, of course!) and I especially loved the ones with little babies. Aren't these foxes gorgeous! They have such beautiful coats! This is an example of how helpful it was to see these animals up close because I could not believe how HUGE this grizzly was. It's one thing to see them in movies or in a zoo quite a distance away, but to be able to stand on the other side of the glass and see the amazing scale of this animal was incredible. 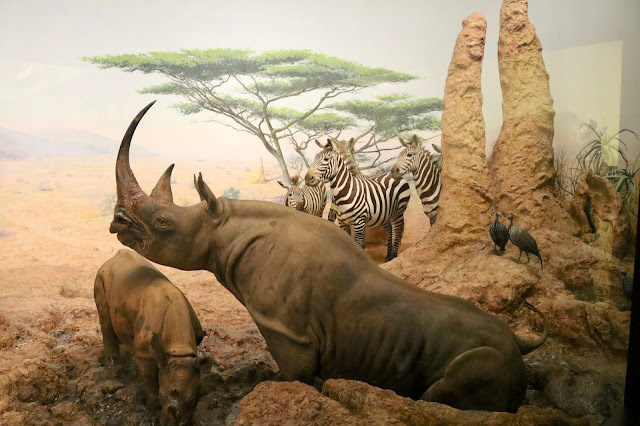 The museum did a very nice job of creating a natural environment for the animals and arranging them in realistic, educational poses. 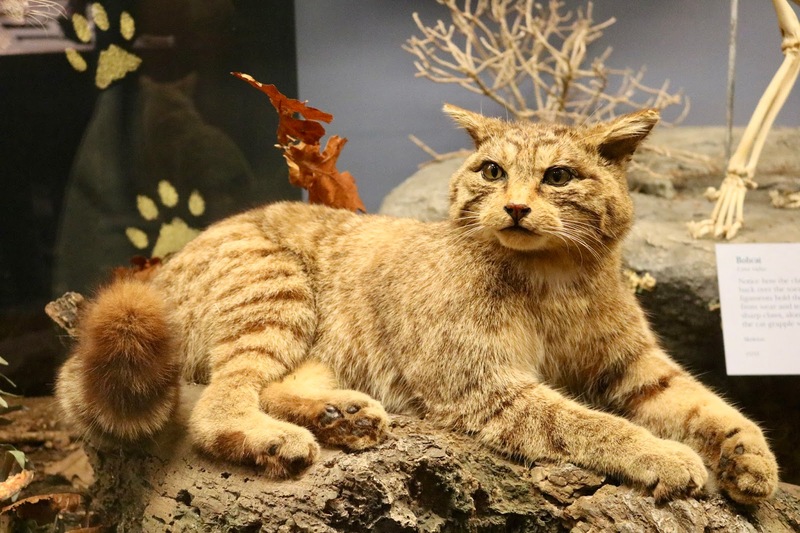 I think I remember reading in this display that this cat is where today's modern house cat originated from. We have the Egyptians to thank for our feline friends today. 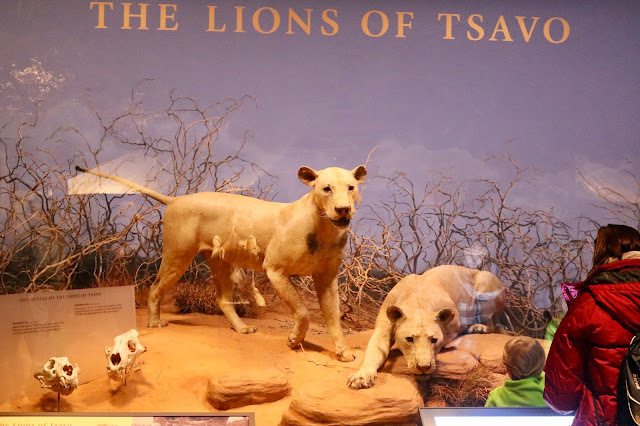 The Lions of Tsavo was a fascinating exhibit. 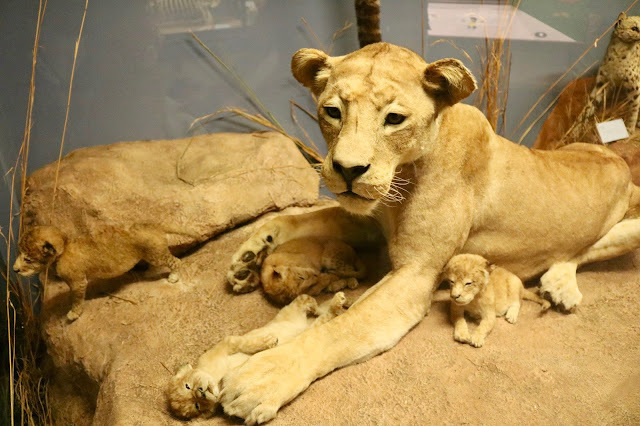 The story is that these lions killed and ate over 135 (current research shows only 35 deaths) railroad workers in Kenya over the course of nine months in 1898. Wow! By now we were ready for lunch and went to The Field Bistro inside the museum. I brought my lunch with me, but I bought lunch for my son plus a cup of coffee for myself for a mere $25.00. 🤣 I guess I should have packed him a lunch too and saved some money. You are allowed to take food into the museum but you have to eat it in designated picnic areas only. After lunch we headed upstairs to see the dinosaurs in the Evolving Planet exhibit because we wanted to be sure to see it before we ran out of time. It was by far the most crowded exhibit in the museum. I just loved the flying pterodactyl in the lobby! 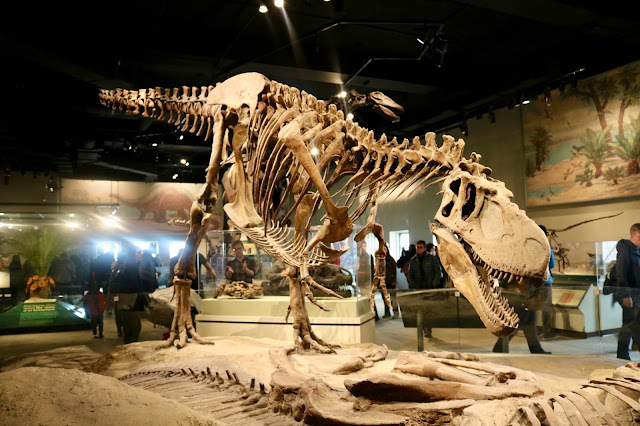 The Chicago Field Museum is famous for it's life-size skeleton of "Sue" a Tyrannosaurus Rex! 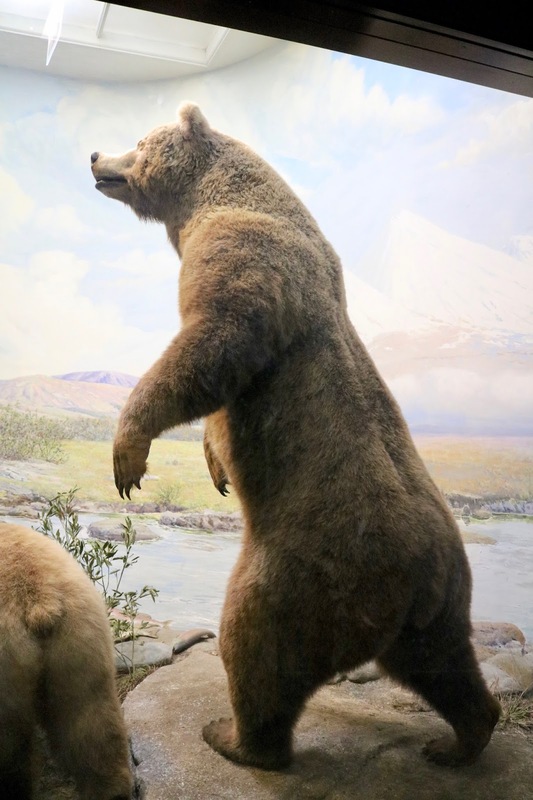 For years, she greeted the museum's guests as they walked in the doors. Unfortunately Sue is no longer in the lobby because she is being moved to a new location in the dinosaur exhibit in the upper level. This exhibit won't be opened until March of 2019. :( It was so funny at lunch because our table was located near where Sue use to be. There was just a sign in her usual spot explaining where Sue was. We kept watching so many people come into the museum looking for Sue and then walking over to the sign and reading it. The disappointment on their faces was heart-breaking. I'm not so sure I agree with the museums decision to move Sue. That has been her spot forever. People liked her there! Some things really are better off left alone. Anyway, in the balcony you can still see Sue's head and other body parts on display. It's a temporary exhibit until she is put back together in her new home. 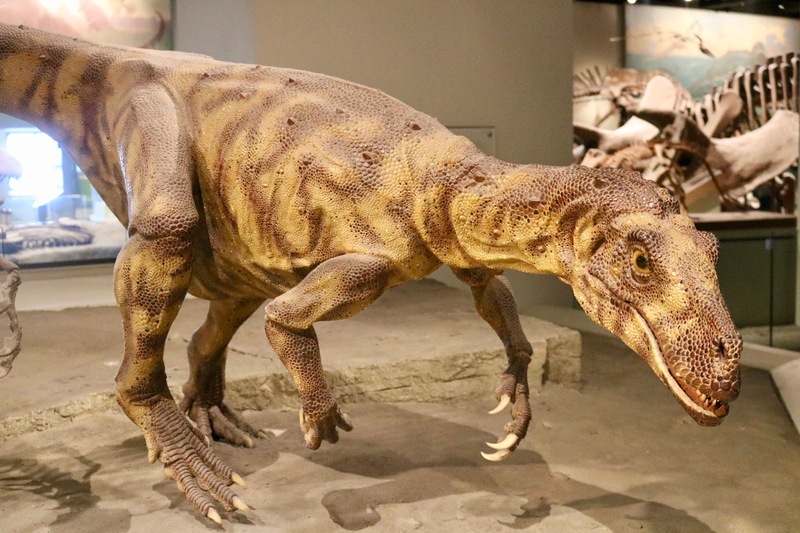 The dinosaur exhibit includes a mix of both skeletal dinosaurs and realistic models like the velociraptor below. 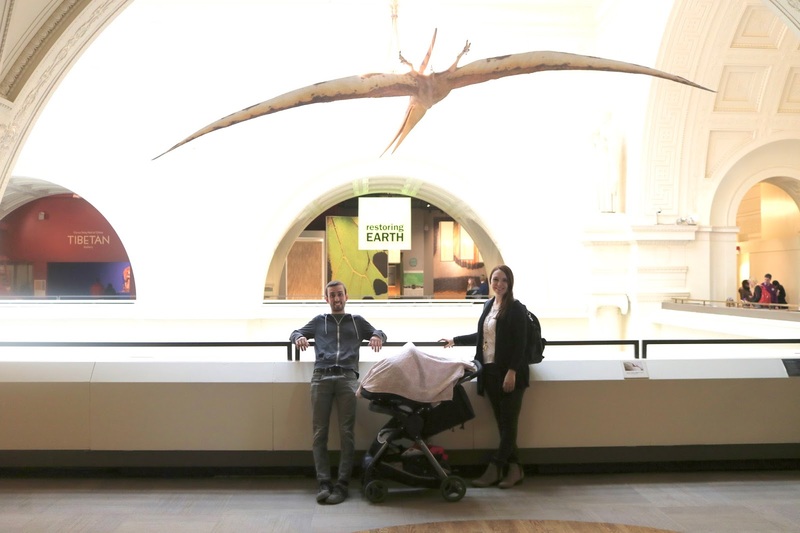 My son Jordan and I breezed through the "Plants of the World" exhibit was Ashley nursed Alethea. It was basically a hall of artificial plants displayed behind glass describing what the plant was and where it was from. Jordan noticed this pine tree immediately because our yard back home is full of them. Ashley, Alethea, and Jason rejoined Jordan and I when we went into the Hall of Gems. This was one of my favorite exhibits because gorgeous jewelry was involved! It showed the original source of the gem and how it is transformed into beautiful jewelry. This was also a very crowded exhibit and it was kind of frustrating for me because I couldn't see the exhibits well through the sea of people. 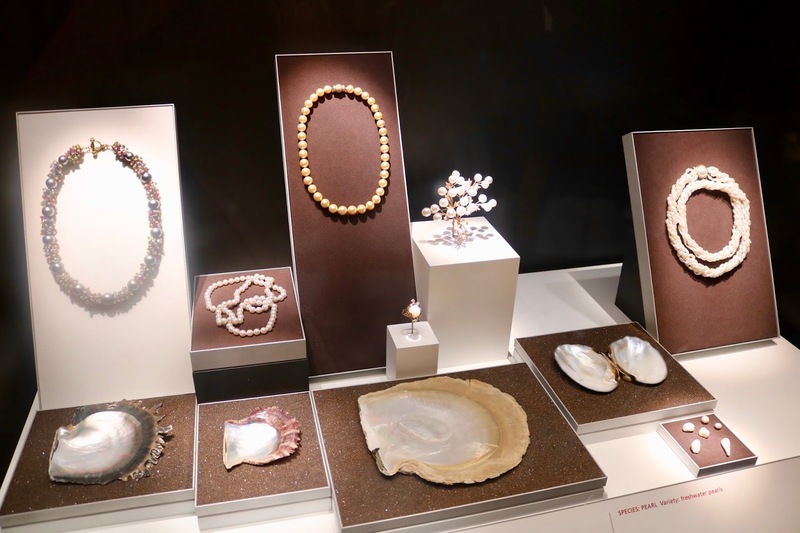 This display shows how precious pearls are made. Also in the west side of the balcony is the Hall of the Pacific. 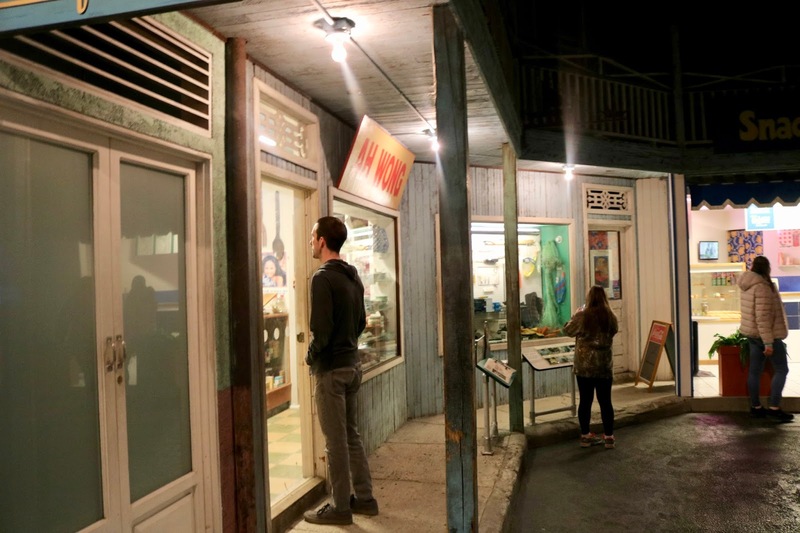 Below Jordan is looking inside a modern rendition of a pacific island town store. And Jason and Alethea checked out Maori Meeting House. This house was originally built on Tokomauru Bay in New Zealand in 1881. 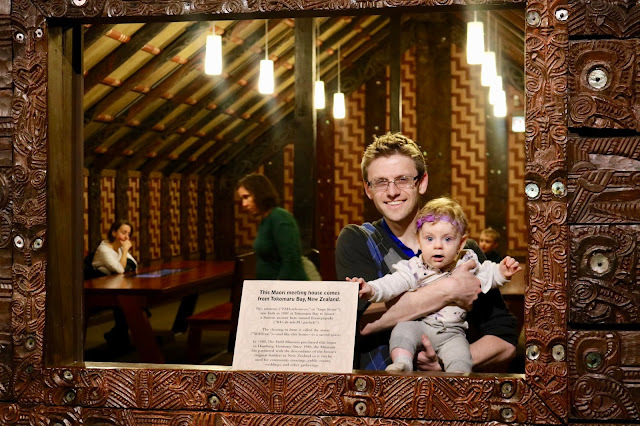 It served as a spiritual outpost for sharing Maori culture and history. I was so amazed by these incredible totem poles. 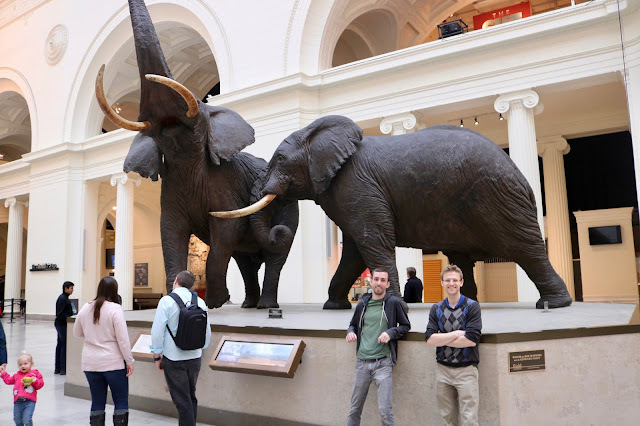 I not only couldn't believe the size of them (they were huge) but how many of them the museum had. This was a huge exhibit. And finally, here's a short video of my son (who is a classically trained percussionist) attempting to play the slit drums. As always, I forgot to turn the camera the right direction. :) Why do I always do that? Better yet, why do the make the video portion of the IPhones like this? No one remembers to turn the camera! Anyhow, I like how my daughter (who has her Master's degree in Voice) instructs him on how to play the slit drum. And what's really funny is watching my perfectionist son try to get it right. So typical of him. 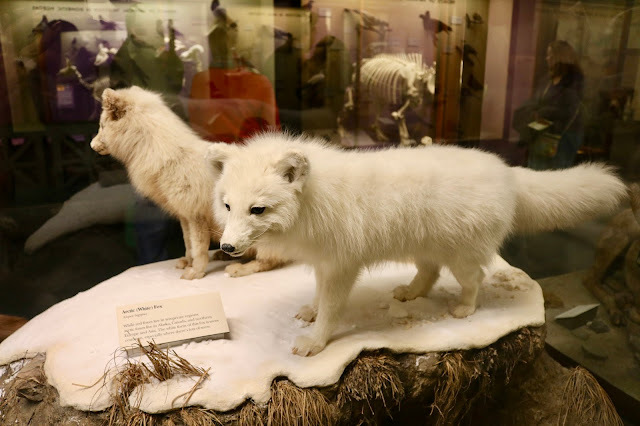 The Chicago Field Museum is open every day from 9-5 except Christmas. They also have multiple "free admission" days for Illinois residents through out the year. We were there on a "free day" that's why it was so crowded. 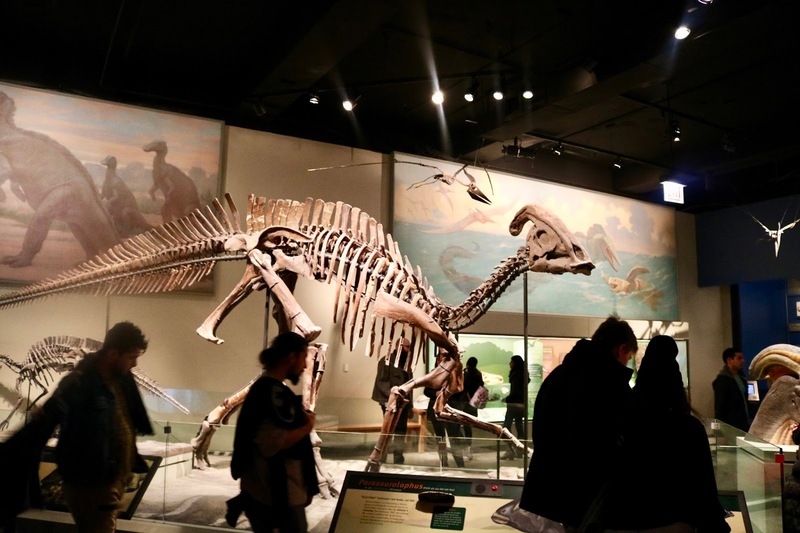 The cost for general admission is $24.00, but there are additional costs for other exhibits. We only went to the general admission exhibits and we still didn't have time to see everything. It's not necessary to pay to see other exhibits unless you really want to. Parking was around $20.00. And that concludes my Illinois Travel posts. I will be leaving for Savannah, Georgia at the end of April and will begin a new travel series in May! 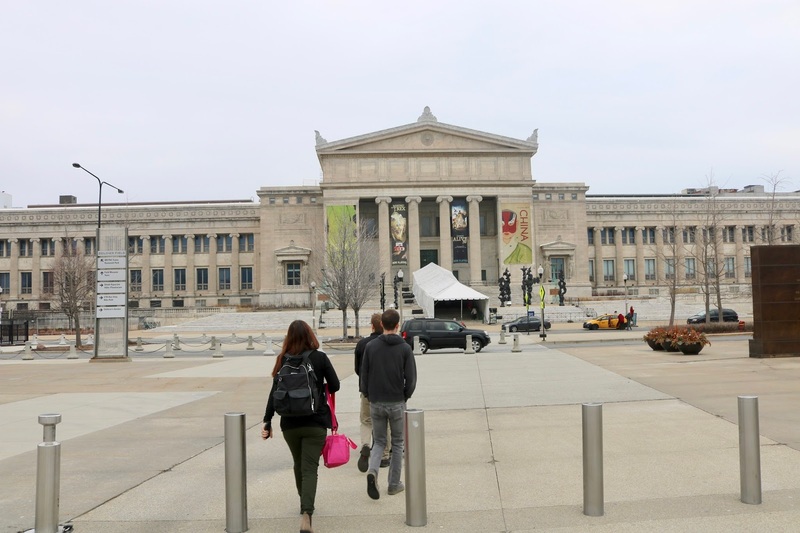 Since we live 2 hours from Chicago, we have been here often, It is one four favorite museums in the world, just love it! This was only the second time I've been there. It was a fun day, but I enjoyed the Chicago Museum of Science and Industry so much more. Wow! That looks like a fabulous museum! Pinned. It is! Definitely worth the visit! Thanks Ashley! It was amazing! The animal displays are so awesome. I love those elephants. Thanks Cheryl! The displays were awesome! We visited the Field Museum many years ago, shortly after Sue became part of the museum. I hope they will give her another amazing place and I am glad they are still keeping her at the same museum. Those types of animal exhibits, although impressive do make me feel sad too, so I can totally relate to your son. It's a shame food always costs so much at these types of places!! Looking forward to your next travel series! Yes, Elli, I'm grateful at least they are keeping the famous "Sue". I'm glad you could understand what Jordan was feeling. Thanks for visiting. 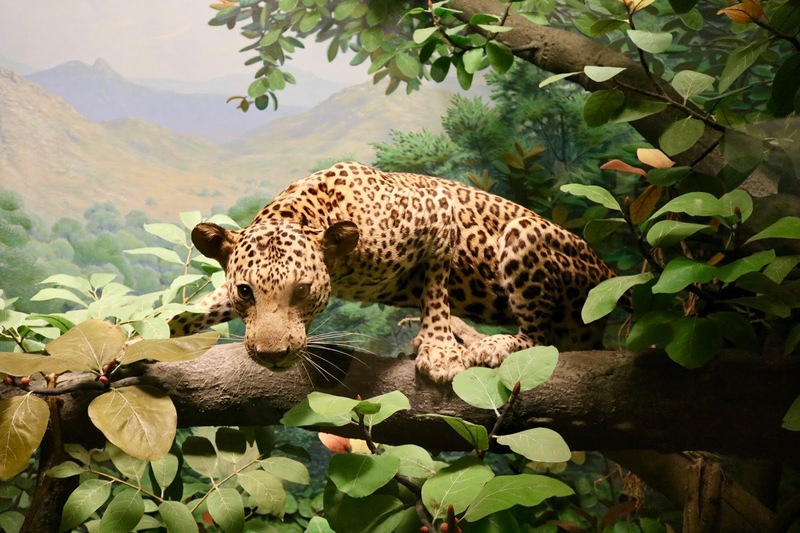 What an wonderful visit and the animal displays are so life like. 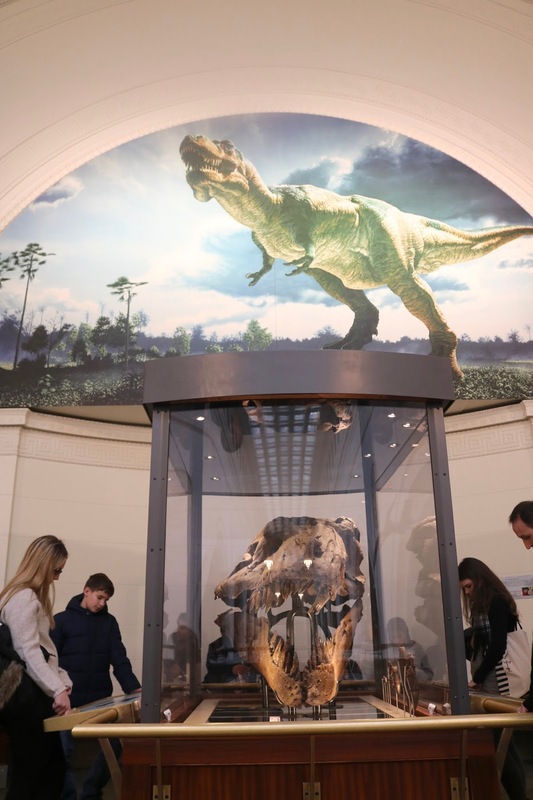 I'm in two minds about the displays but children can learn much from visiting museums. My friend has visited Chicago from Australia recently and loved the city. Thanks for sharing your field trip with us Amy at #MLSTL. have a great week! Well, you've certainly been to some interesting places while you've been visiting the family - your little granddaughter will be quite an expert on things at the rate she's going! Thanks Leanne! I'm sure Alethea will! I love visiting museums and this one has so much to offer. I really like seeing skeletons, it's crazy to see how big some of the dinosaurs and animals were! Yes, I know! Can you just imagine being alive back then and running into one of these guys? Yikes! I would love to go back and see the Field museum in Chicago. I have only been there once and I do remember their expansive collection of animals, birds, etc. I was I think in my 20's when I went there last, so it's been awhile. I've been to Chicago since then, but gosh... how do you ever decide what to all cram in?! It looks like you had a great time! They def. didn't have those elephants when I was there last. You are so right, there is so much too do and see in Chicago, it's hard to make a decision what to do. We picked museums to take advantage of the free days and because the weather was bad. The last time I was there was when I was in high school! Looks like it was such a fun day! I bet that was disappointing about Sue. Thanks Amy, it was fun even if we missed Sue! I still haven't been! I will definitely be going on a free day, though! I love all the cat displays the most, too! I forgot, you live in Chicago...yes, you need to get there!